October average temperatures ranged from 2°F to more than 8°F above normal for the entire Northeast. The Northeast wrapped up October on the warm side of normal, with average temperatures ranging from 2°F above normal in southern West Virginia to more than 8°F above normal in parts of New York and New England. 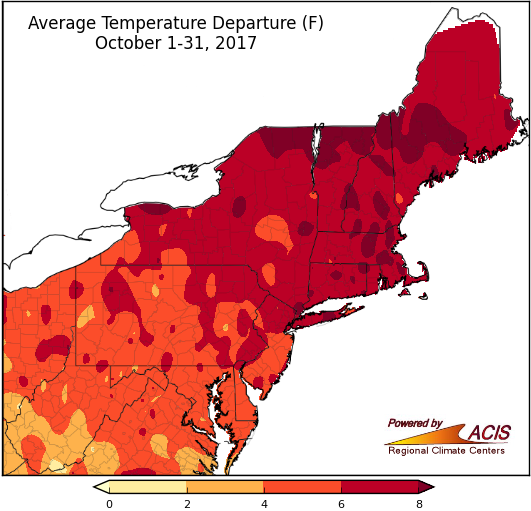 Average temperature departures at the 35 major climate sites ranged from 3.0°F above normal in Huntington, WV, to 10.5°F above normal in Burlington, VT. Eleven major climate sites ranked this October as their hottest October on record, and another 16 sites ranked it among their top five hottest Octobers on record. The remaining eight sites ranked this October among their top 20 hottest. Eleven major climate sites had their hottest October on record. Burlington, VT, had the greatest departure from normal at 10.5°F above normal. 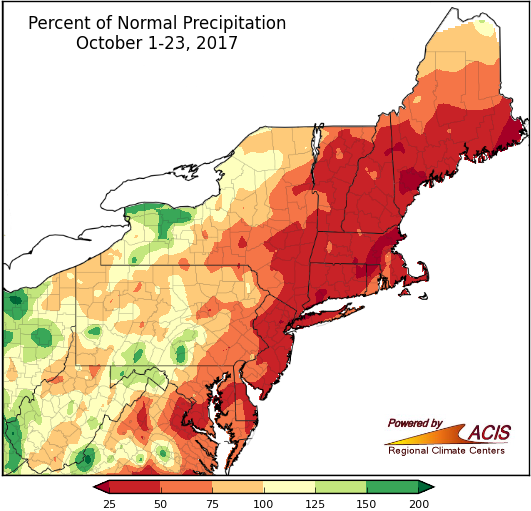 Most of the Northeast received 100% to more than 200% of normal precipitation in October. 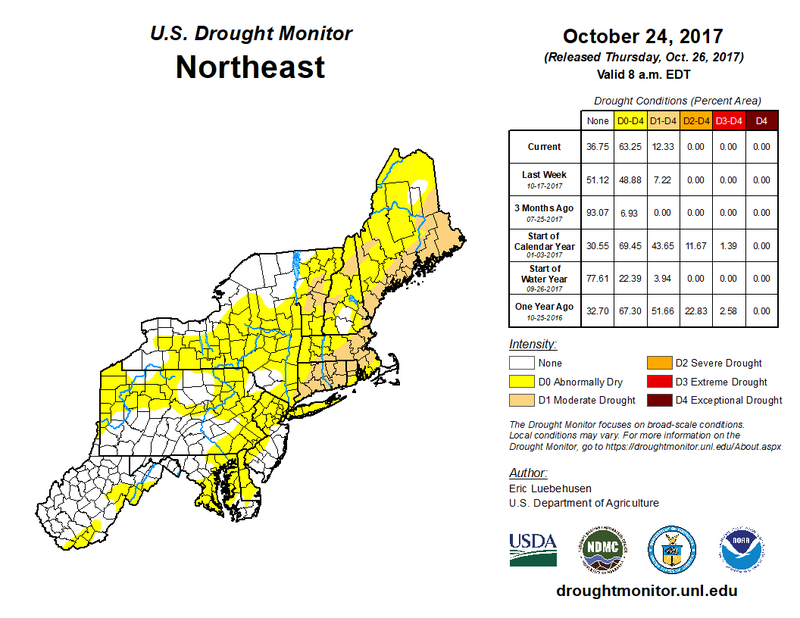 The first three weeks of October were drier than normal for a large portion of the Northeast. Abnormally dry and drought conditions expanded during the month. However, two late-month storms dumped heavy rain on the region, taking conditions from dry to drenched in the span of a week. 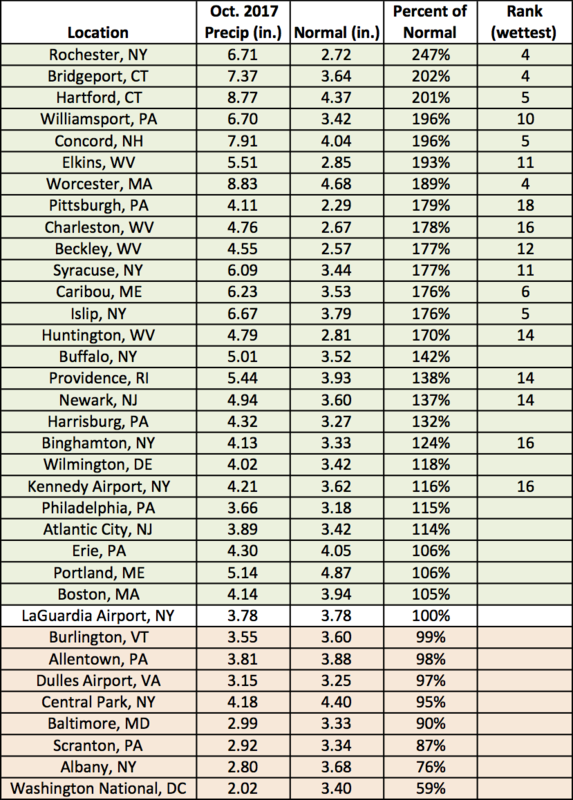 For instance, from October 1-23, Worcester, MA, had only received 20% of its normal precipitation. The site picked up 8.11 inches of rain in a week and wrapped up October with 189% of normal precipitation, making it the fourth wettest October on record. 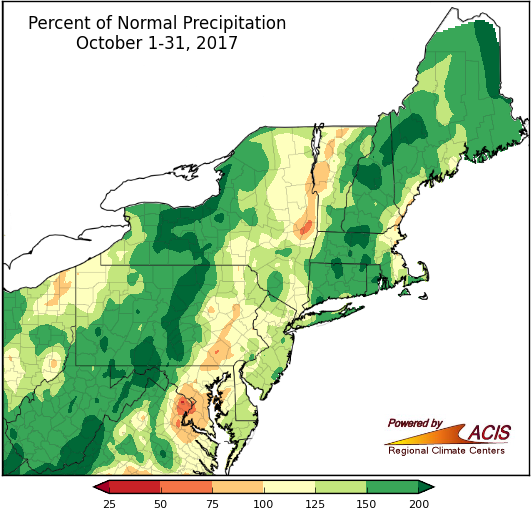 So for October, precipitation ranged from 75% of normal to more than 200% of normal, with a majority of the Northeast seeing 100% to more than 200% of normal. October precipitation at the major climate sites ranged from 59% of normal at Washington National, DC, to 247% of normal in Rochester, NY. Twenty-six of the major climate sites were wetter than normal, with 18 of those sites ranking this October among their top 20 wettest Octobers on record. 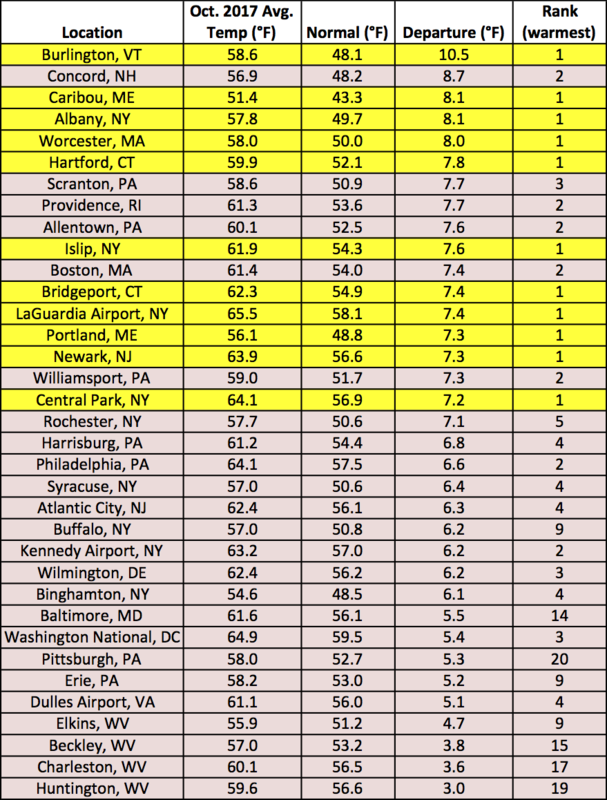 Eighteen major climate sites ranked this October among their top 20 wettest, with the wettest site (in terms of percent of normal) being Rochester, NY, at 247% of normal. Washington National, DC, was the driest at 59% of normal October precipitation.